Villa Flores do Golfe 1 is a holiday home set in Vilamoura in the Algarve Region and is 2.3 km from Vilamoura Marina. The air-conditioned unit is 3.2 km from Falesia Beach. Free private parking is available on site. Max Apartment is a comfortable apartment set in trendy Vilamoura, just a 7-minute drive from the centre. The property features a green garden and a, outdoor swimming pool. Located a 5-minute drive from Vilamoura Marina, Villa Wilker includes an outdoor swimming pool and a lawn terrace offering views of the surrounding greenery. This air-conditioned villa is 1.5 km from the Aquashow Water Park. An airport shuttle, car and bicycle rental, and an outdoor swimming pool are featured at Al Garb. 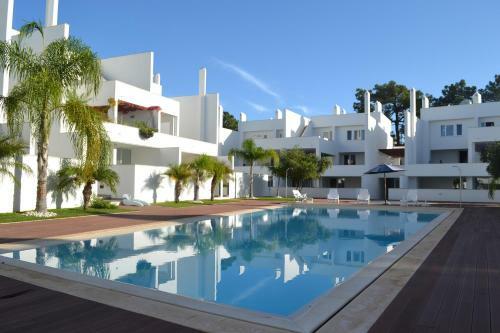 This unit provides modern self-catering apartments in Vilamoura, 2 km from the marina.